Today we launched “Discover FarmCoast,” a blog designed for the FarmCoast organization which promotes the history, culture and events of select communities in southern New England. The parent website is largely static, providing visitors with a wealth of information about beaches, restaurants, galleries and more. So when they came to us with the idea of a blog, we were delighted to give the site a component that would update frequently and allow the organization to reach reader’s in the conversational voice. Blogs and Facebook can be used to accomplish similar goals. They both offer a way to quickly distribute news-worthly information rapidly to a wide range of readers and they both offer readers the opportunity to respond. That said, Facebook (et al.) and Blogs are not the same and should be used as different tools to accomplish different goals. Social Networking sites like Facebook and Twitter are perfect for brief remarks and announcements, as well as engaging an already plugged-in community. Blogging however is a magazine-style vehicle that communicates to a more committed reader (or consumer) with content that has a certain amount of depth. 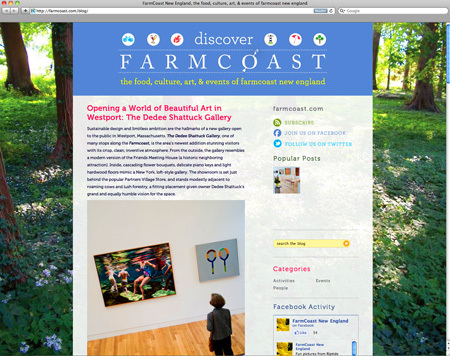 Blogs like Discover FarmCoast become a destination for a community of readers to browse at a leisurely pace, exploring an area of interest that already appeals to them. Sites like this get bookmarked and read regularly, with reader’s having an expectation of frequent updates of quality content (of any length). Like reading your favorite magazine, the best blogs utilize beautiful large images and bite-sized paragraphs. If you are thinking about launching a blog, as a component of your business or as a stand alone project, consider hiring a writer and/or photographer to assist your group in generating content. A well-kept blog is a treasure for readers and an priceless marketing tool.